It was well below freezing today. I went outside with every bit of skin covered except for the area right around my eyes, since seeing is useful. But it was still a good day for birding. 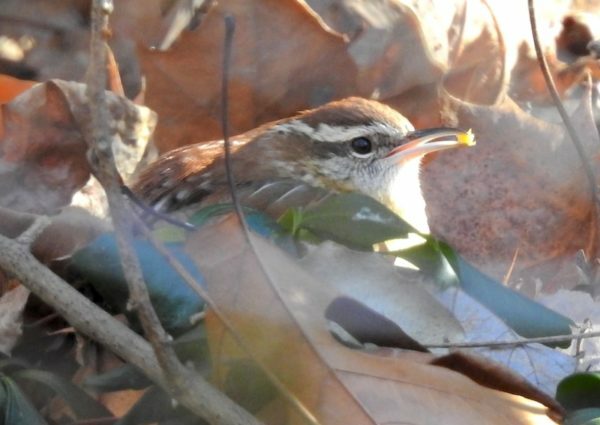 I saw three new species for me—a yellow-bellied sapsucker, a Carolina wren, and a northern mockingbird—and also a pileated woodpecker, which I’ve seen before but never at home. 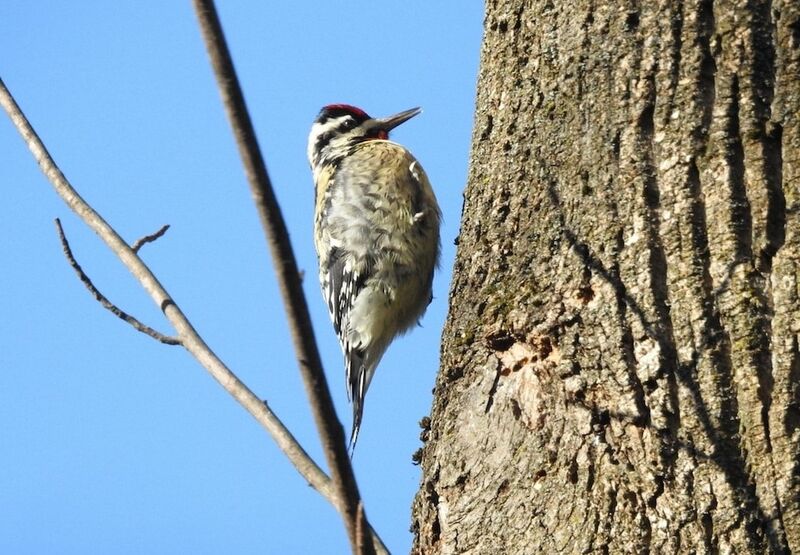 This yellow-bellied sapsucker has legs, but you’d barely know it from the photo. (Squint and you might see the tips of its claws emerging from its belly feathers.) I caught this shot mid-hop as it scurried up the side of the tree. I stood in the cold taking pictures of this guy for 20 or 30 minutes before really giving much thought as to what kind of woodpecker it was. Maybe the cold weather had slowed my brain. When I got home and started looking through my photos, I noticed the yellow tinge in the feathers. And then I noticed the patch on the throat. That was a dead giveaway that it was a yellow-bellied sapsucker adult male. 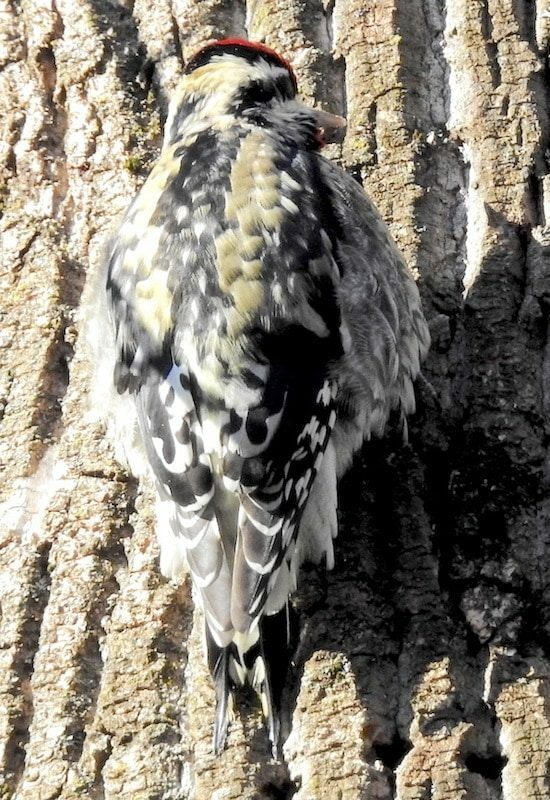 Yellow-bellied sapsuckers have a more southern range than hairy woodpeckers and downy woodpeckers. They get their name from drilling holes in tree bark to bring sap to the surface and attract insects, which they then eat. Wisconsin falls within the range of yellow-bellied sapsuckers, but only during summer and migration. That means you need to peer into the leafy treetops to find them, and of course it’s harder to find birds among leaves than bare branches. Since they prefer denser forests and woodlands than the woodpeckers I see at home, it’s unlikely I would find them in my Madison neighborhood, although more tree-dense areas of the city (such as the Arboretum) might have them. 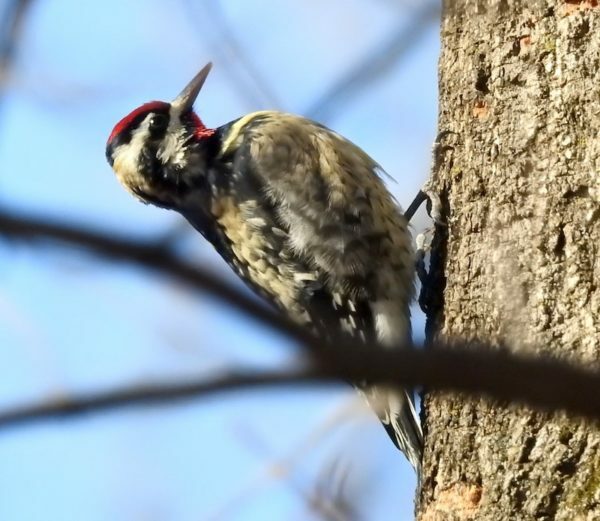 >> Read more of my posts about woodpeckers. 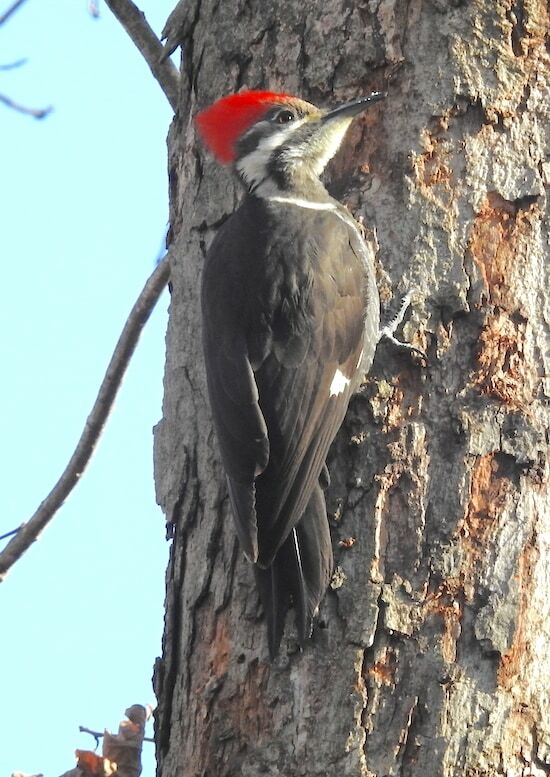 For the curious, here’s the pileated woodpecker. It called like a monkey and annoyed all the other birds at the nearby suet feeder. The white dots on its beak are suet. I didn’t get a picture of the mockingbird. It perched outside the window while I was working on my computer. I reached for the camera, which I thought I’d left next to the desk just for occasions like this. But it wasn’t there. The mockingbird stayed there just long enough for me to figure out where my camera was.